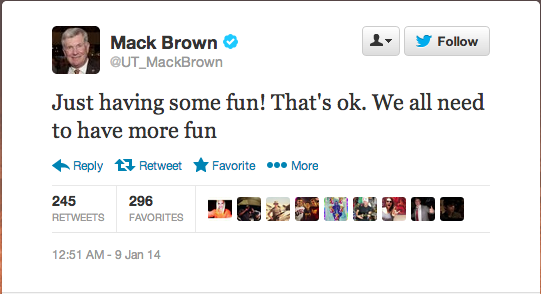 Mack Brown is entering retirement with a newfound hobby: exploring Twitter. 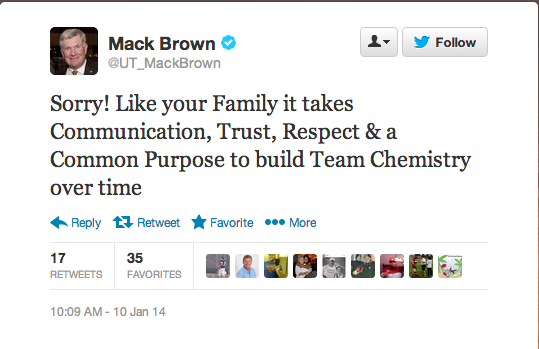 Since leaving the Longhorns, Brown has taken to tweeting near-poetic questions to his audience: “Broncos or Chargers & why?” and life advice fit for a needlepoint pillow: “You will regret time not spent with a husband, a friend, a child or a parent.” His tweets read like those of a grandfather who’s just learned how to use his desktop computer, and there’s something charming about a man with as much power as Brown once had tweeting out, “Just having some fun! That’s ok. We all need to have more fun.” Of course, there are also the oddly placed exclamations, like the “Sorry!” Brown tacked at the beginning of a tweet that said nothing even remotely offensive. Sure, we’re tempted to tease Brown for his clumsy tweets and gratuitous use of the abbreviation “U,” but we’re just too damned charmed by his new, more open online persona to say anything that would discourage it.